Online company Taurus Legend based in Victoria, Australia has launched a huge selection of tile and cutting tools, power tools, hand tools and home and garden products. Australian company Taurus Legend has launched an extensive collection of high quality automotive equipment, power tools, tiling tools and home and garden products. The company specializes in offering Australia’s best brands through their online store. 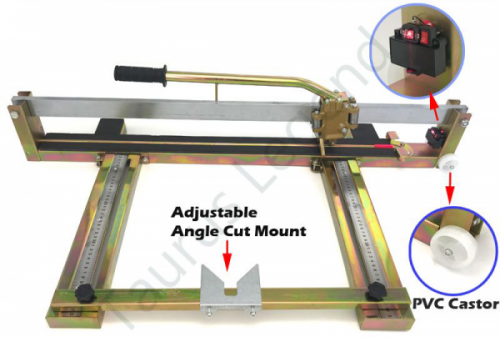 The online store stocks a huge variety of products including what they consider to be the best industrial grade tile cutter in the country. This product is an all steel professional heavy-duty 800mm ceramic porcelain manual tile cutter with laser level tile flooring cutting. It is made for industrial projects with a max cutting thickness of 20mm. They offer other tiling products including 2-piece and 4-piece tile leveling systems for use in any tiling project industrial or otherwise. The site has a huge selection of tiling and cutting tools suited for any project. Automotive equipment includes car ramps and dollies, hydraulic jacks, vehicle stands, T-bar and drive sockets and vehicle accessories. They work with trusted brands such as Berent, Newqida, Shenqiwei and their own in-house brand, Taurus Legend. Vehicle accessories include emergency kit must-haves like heavy-duty jump start booster cables, quick bulk loading grease guns and flexible hose auto tools. The site also carries a large selection of hand tools including clamps and pliers, glass related tools, knives and cutters, measuring tools, spanners and wrenches, hammers and mallets and staples and rivet guns. Home and garden products include plant fertilizer and water sprinklers and irrigation supplies such as garden water hoses, reels, guns, wands, fitters and connectors. They also stock plumbing supplies, safety workware, toys and hobbyist products and a large variety of power tools. The site ensures secure payment and fast delivery on all orders. The website also has a useful price breakdown feature so users can filter products based on their budgets for total ease of shopping. Interested parties can find more information and place orders at the link above.